Boat Hire Amsterdam Westerpark: Good Location & Best Rates! Our boat hire is located at the ‘Westerpark’ next to the ‘Westergasfabriek’, just west of the old city center. This is an excellent starting point for an Amsterdam canal tour. Just 10 minutes by boat from our boat hire location is the ‘Brouwersgracht’. This canal is widely considered as the most beautiful canal in town. It is also a main connection between the four most famous Amsterdam canals. !!! -> VIEW GOOGLE MAPS FULL SCREEN <- !! The ‘Westerpark’ is a very popular yet laid-back park in English garden style. And the ‘Westergasfabriek’ is an old gas factory transformed into a cultural hotspot. So there’s a lot to see and do before or after your boat hire. Please check our recommendations on nearby Westerpark cafes and restaurants. 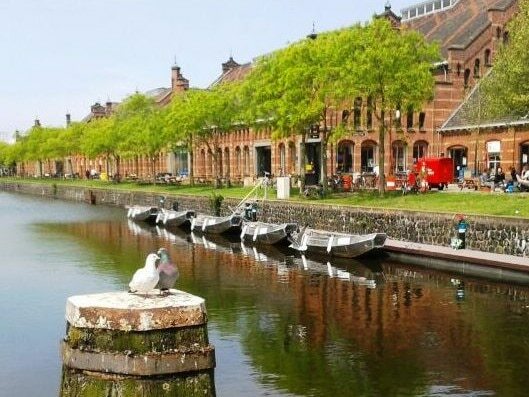 Our boat hire is located at the ‘Westerpark’ next to the ‘Westergasfabriek’, just west of the old city center. This is an excellent starting point for an Amsterdam canal tour. Just 10 minutes by boat from our boat hire location is the ‘Brouwersgracht’. This canal is widely considered as the most beautiful canal in town. It is also a main connection between the four most famous Amsterdam canals. HOW TO GET TO OUR BOAT HIRE? After you’ve made your reservation our staff will await you at our boat hire. Our dock is located in the canal right next to the old green metal bridge and the ‘Bakkerswinkel’ at Polonceaukade 2. This is a bakery café; a great place to have breakfast, lunch or a coffee break. They also have a take-away shop. 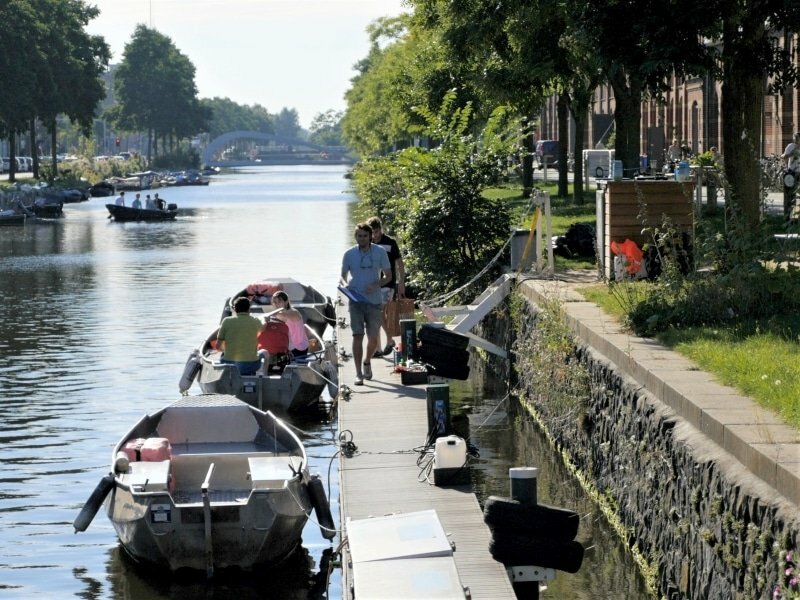 Our boat hire is within walking distance from the northern Jordaan area, the northern canal belt and Central Station. A taxi normally costs € 10,- to € 20,- from anywhere in the city center. Parking is easy just opposite our dock on Haarlemmerweg. And there are good tram (lines 3 and 5 from the city center) and bus (lines 18 and 21 from Central Station) connections nearby. In case our boat hire at the Westerpark is inconvenient to you (e.g. because you’re in the south of Amsterdam) we recommend to rent a boat at Boaty Boat Hire in the southern city center. Boaty is located in ‘De Pijp’ area (next to the famous Hotel Okura). Boaty has very similar boats, rates and services.